It’s Spring Again. Everybody Know it’s Spring Again. Sorry, I always turn on the Biz Markie this time of year. It wouldn’t be spring without him. This image and post is dedicated to my stepfather, Wally, who bought me my first camera about 20 years ago. Wally has a birthday this month. Happy Birthday! It was a Pentax K-1000, a manual-only film camera in which I learned the basics of exposure. In my opinion, this body is one of the best values of this class and generation of camera available and still underrated. It’s too bad they don’t make a digital version of this camera today. Having a manual-only digital body would something else. I use manual mode about 95% of the time anyway, so I guess it wouldn’t be a big difference. I took this photo on a recent hike in the Missouri Ozarks. 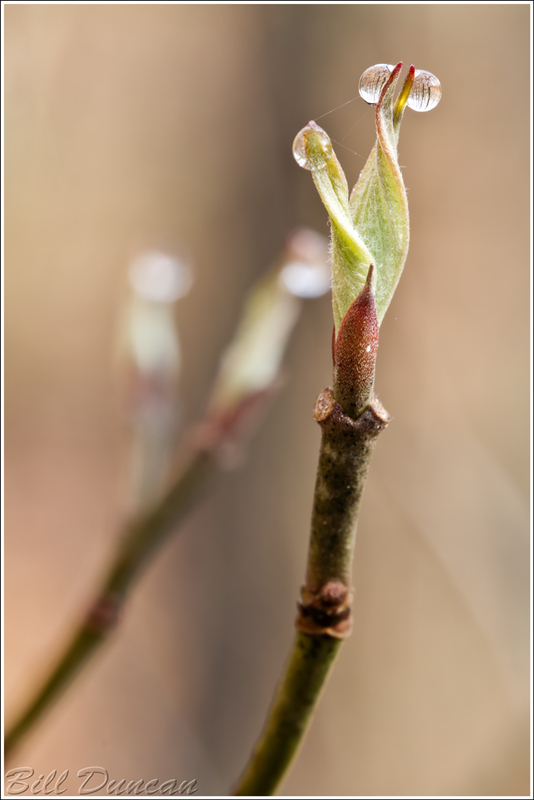 This bush must have had two dozen of these emerging leaf buds, each with a drop or two from gutation. This phenomenon is seen when plants are growing in high humidity or in very saturated soils, like many parts of our region have been experiencing lately. Between the low light and the high macro magnification getting a sharp image of the foreground subject was tricky. I pulled out the reflectors to bring a little more light to the situation, but this only helped a little. Perfect little beads – just beautiful! I will need to look more closely and carefully – I have never seen this before.